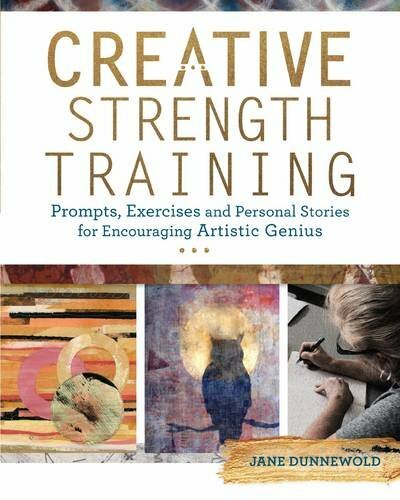 Jane Dunnewold's new book Creative Strength Training is a collection of exercises with the aim of to keep your creative engine run along smoothly. The book's split into 10 chapters which each chapter talking about a specific activity that you can embark on to explore your creative side. Take the first chapter for example. It's about writing. It may seem like it has nothing to do with art. Maybe. But it's more about finding yourself, knowing who you are through writing. Writing is personally something I recommend all my friends to do when they feel lost and trying out to figure out something about their life. It's an incredible powerful tool and really helps to know who you are. And it certainly trains the mind. There's one chapter on dealing with your inner critic, how not to let them affect your work. Other chapters are about learning to create with limitations, setting aside time to create, finding your distinct style, and exploring. Each chapter is an essay that talks about the benefits of the activities, and at the end of the chapters are examples from other artists. This book is not about specific techniques like how to paint or create certain effects. It's about the process of creating art and thinking about art. Overall, I found the content to be enlightening and inspiring. It's not about reading the book but about following through and only then can you train yourself creatively. Nice book.